I love doing dramatic makeup on models for photoshoots, but when it comes to myself, I like to keep things very simple, soft and natural. 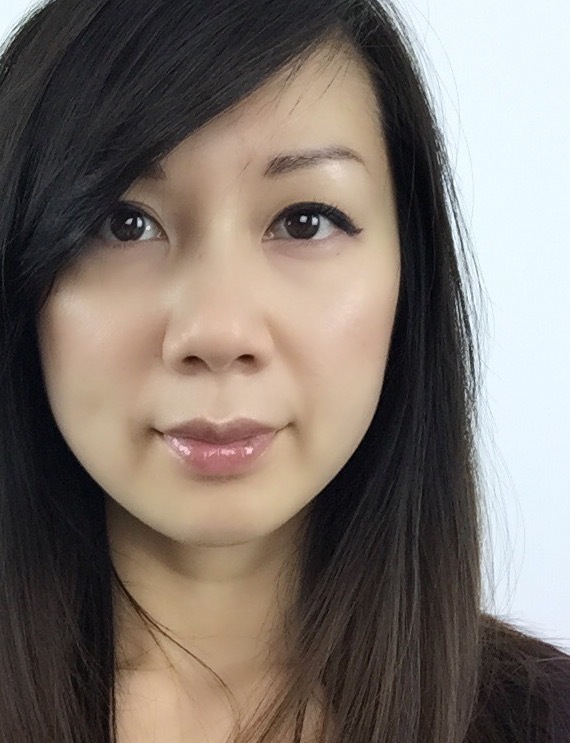 For myself, I never like to look like I’m wearing a ton of makeup. 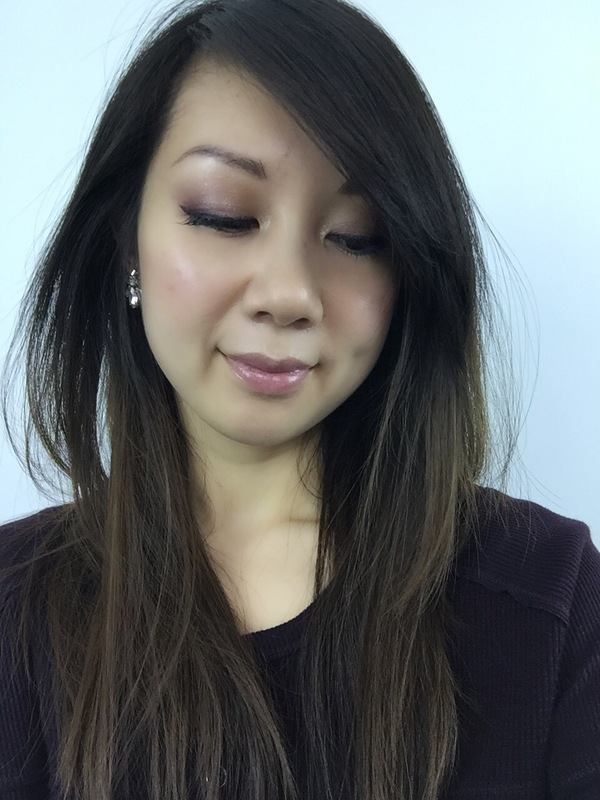 If you’re anything like me, then here’s how to create a simple and soft makeup look with a touch of gold glitter to ring in 2015! 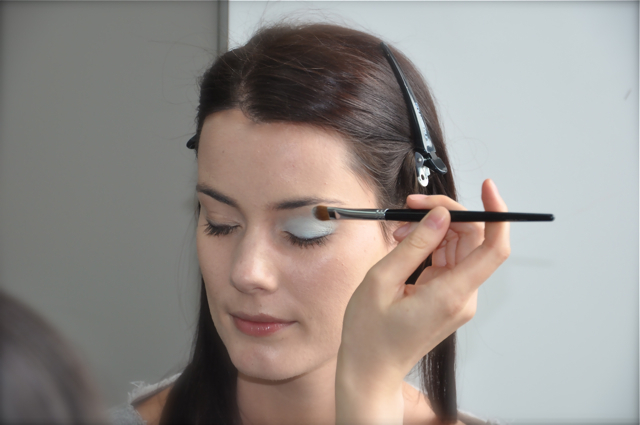 Step 1: Tight line the lash line and thickly line the upper lash line with shu uemura drawing pencil in black. 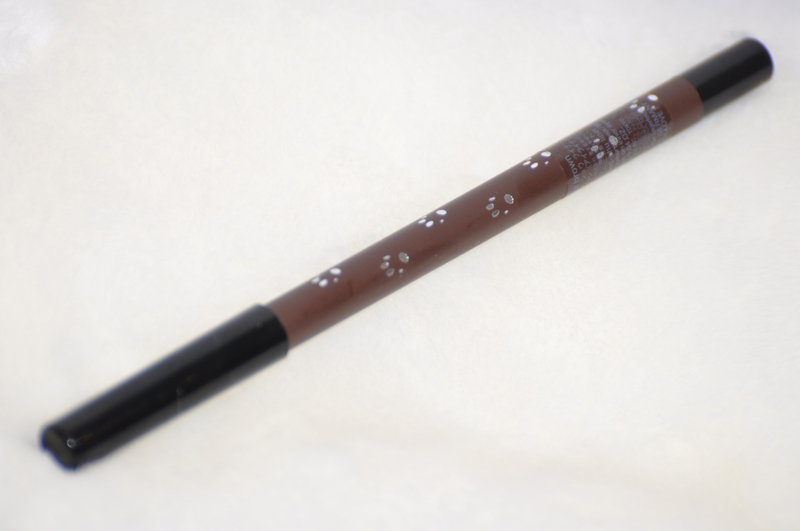 Use the brown glittery shupette drawing pencil to perfect the black liner and to create a slight cat eye. 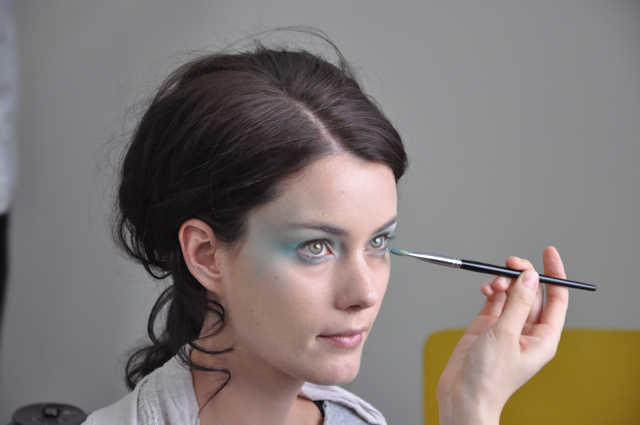 Step 2: Brush the cool purple shadow (#1 in image) starting from the outer 1/3 of eyelid using brush 10. 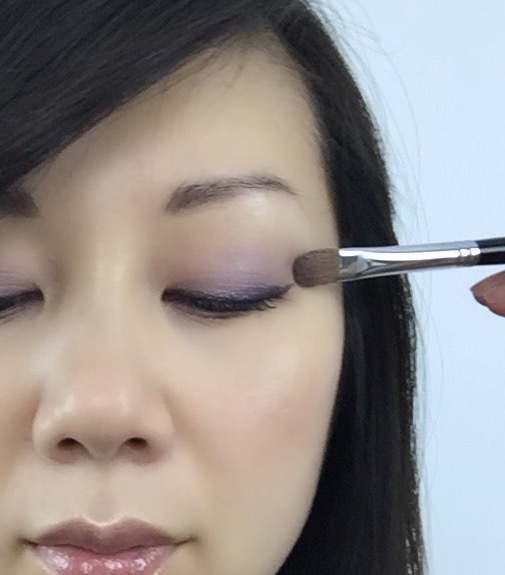 Step 3: Blend the golden taupe shade (#2) into the purple shade starting from the centre of the eyelid. 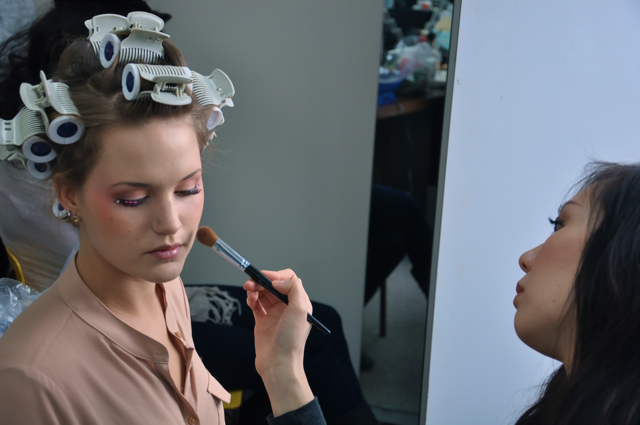 Step 4: Create depth using the plum shade and brush 5R. 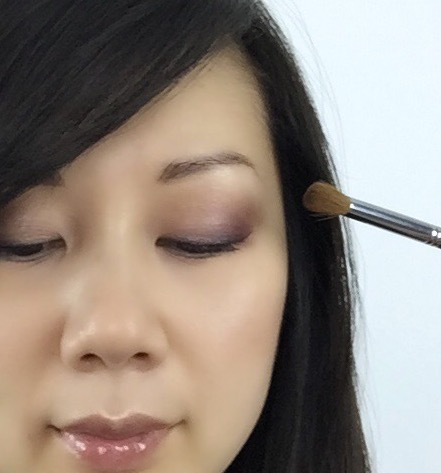 Step 5: Soften the plum shade using the golden yellow shade (#4) and brush 8H. 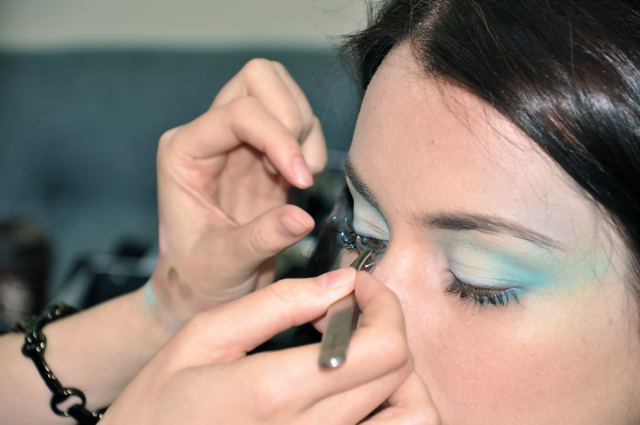 Step 6: Apply gold glitter to the centre of the eyelid and in the inner corners of the eyes using finger tip. 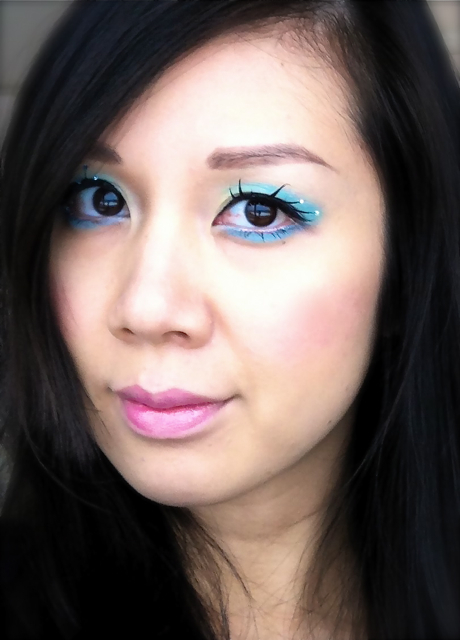 Re-line the eyes to create a more evident winged eye. 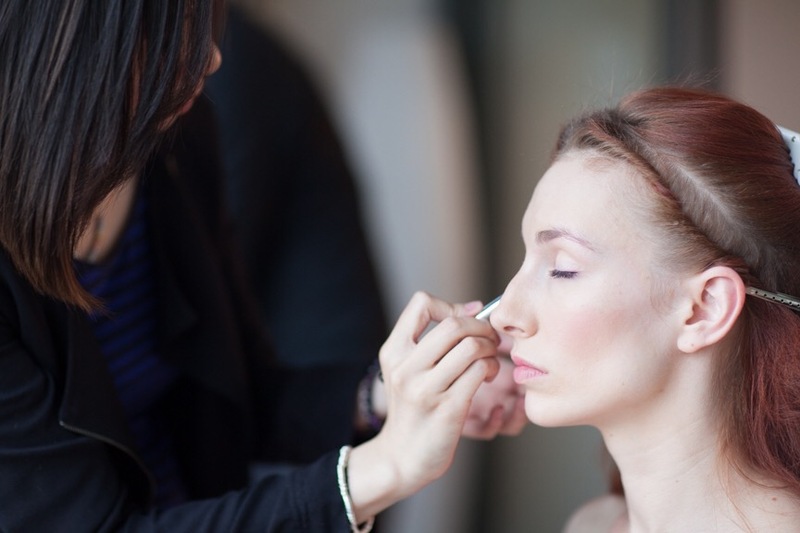 Step 7: Apply mascara and shu uemura black v false lashes and pat the silk cushion cheek blush onto cheeks using finger tips. 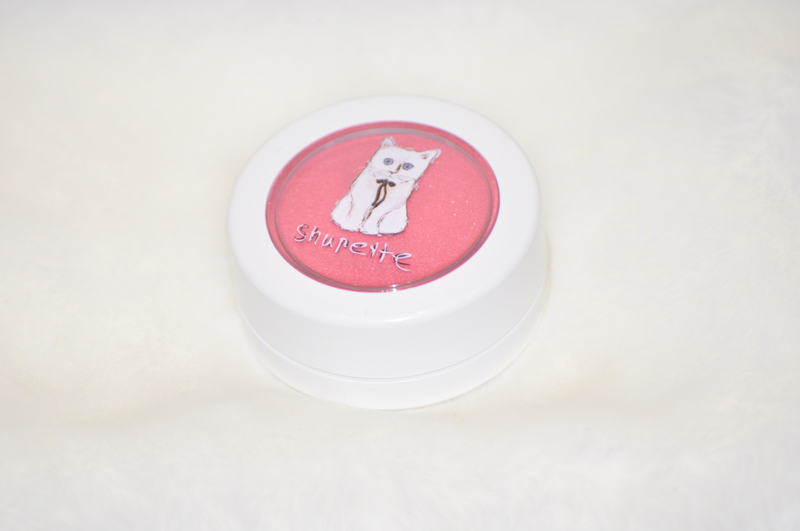 It’s a moist blush that turns to a powder finish when applied. 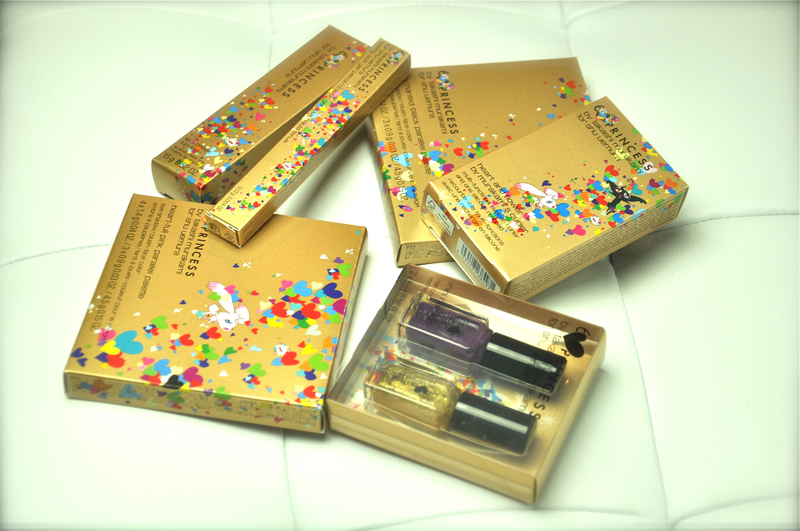 this year, shu uemura has collaborated with japanese pop, animé and otaku artist, takashi murakami, for their 2013 holiday collection. murakami is known for his “superflat” style which uses classical japanese painting techniques to create pop art. his upcoming artwork is called 6 heart princesses (6HP), which is an animation film that will be aired as a TV series next year. the premise of the series is 6 regular girls transform into 6 good princesses who fight against 1 evil princess. 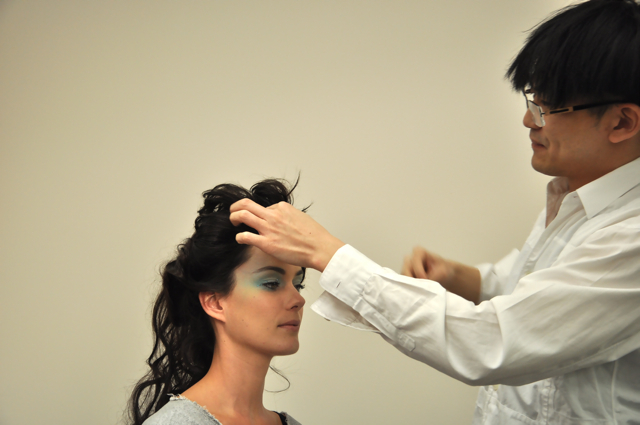 the transformation is reminiscent of sailor moon! 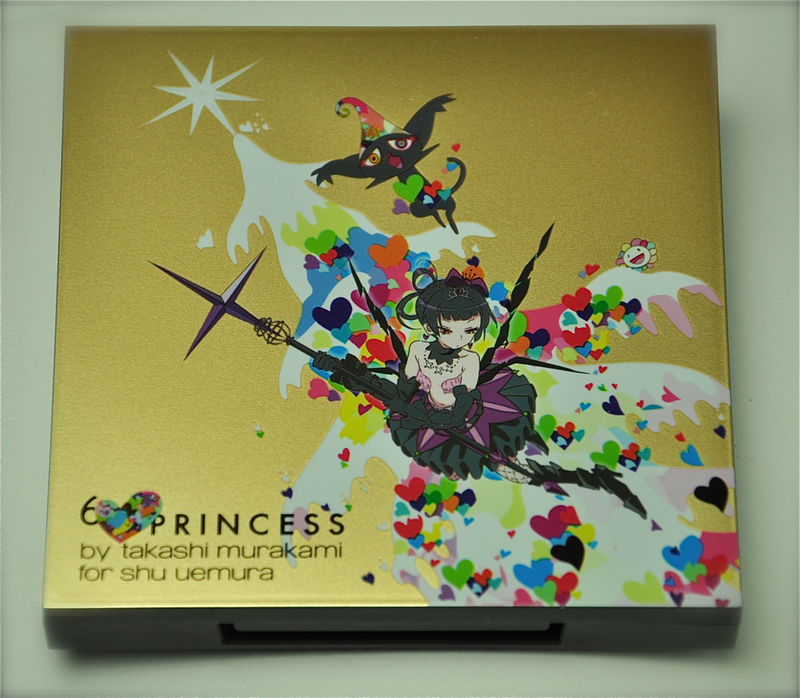 the shu uemura holiday collection consists of one of the good princesses (pink princess) and the evil princess (black princess). the theme for the collection is “dual beauty” which suggests that every woman has two sides: naughty and nice. the two palettes, pink and black, allows us to express both natures. 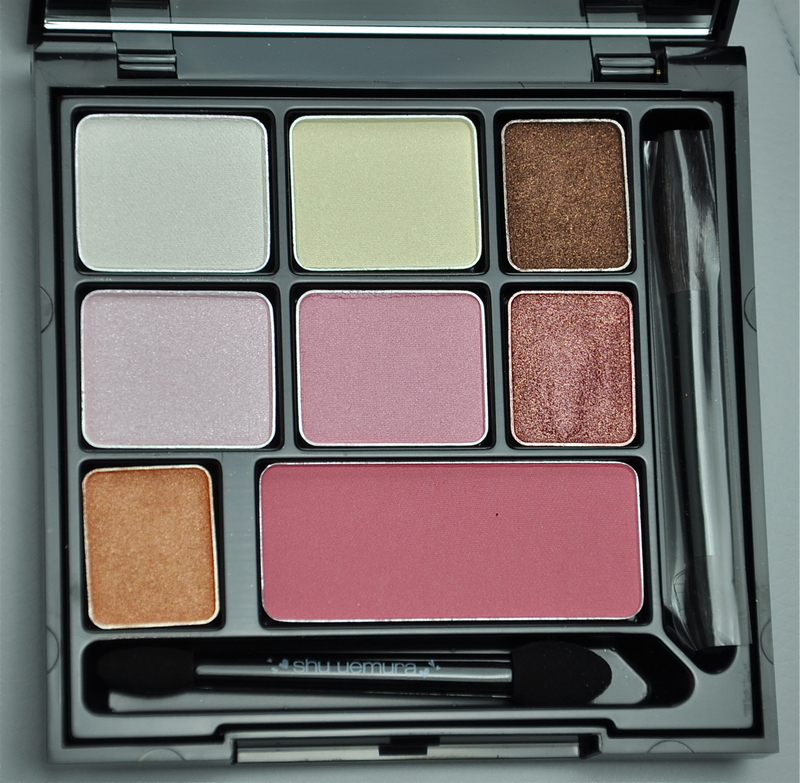 the pink palette contains 7 warm eyeshadows and one powder glow on blusher. 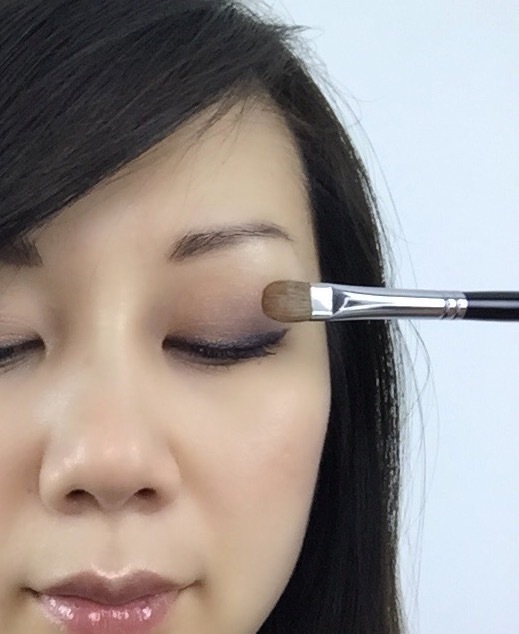 the darker brown shade is typically used for the lash line and contouring. 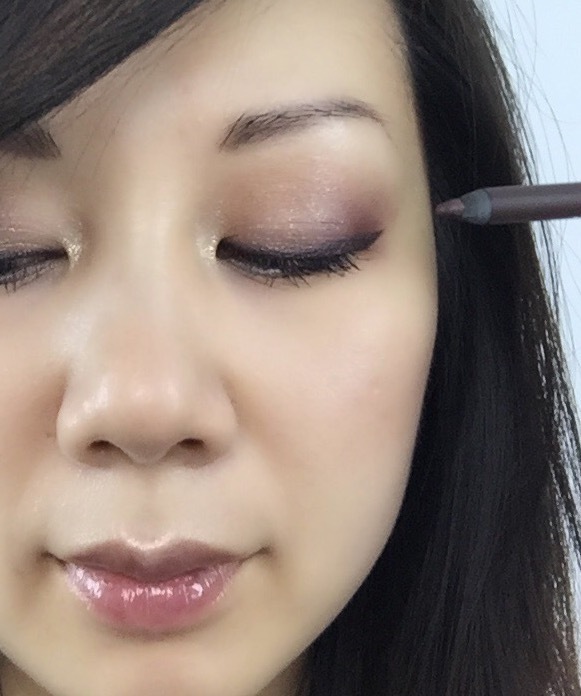 the reddish brown is used for the centre of the lid whereas the orange shade is used to blend out the reddish brown to create a flawless gradation. but of course those are just general guidelines on how to use them, you can use the however you’d like! 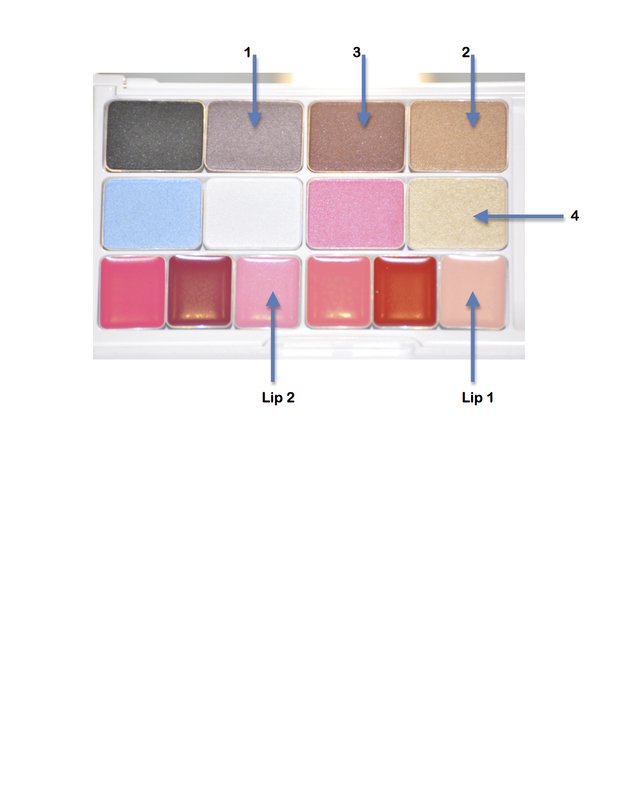 the iridescent white and yellow shadows are used for highlighting (the brow bone, the inner corners of the eyes) and the iridescent pink shades can be used to highlight the centre of the lids or used to soften edges of the brown shades for nice gradations. 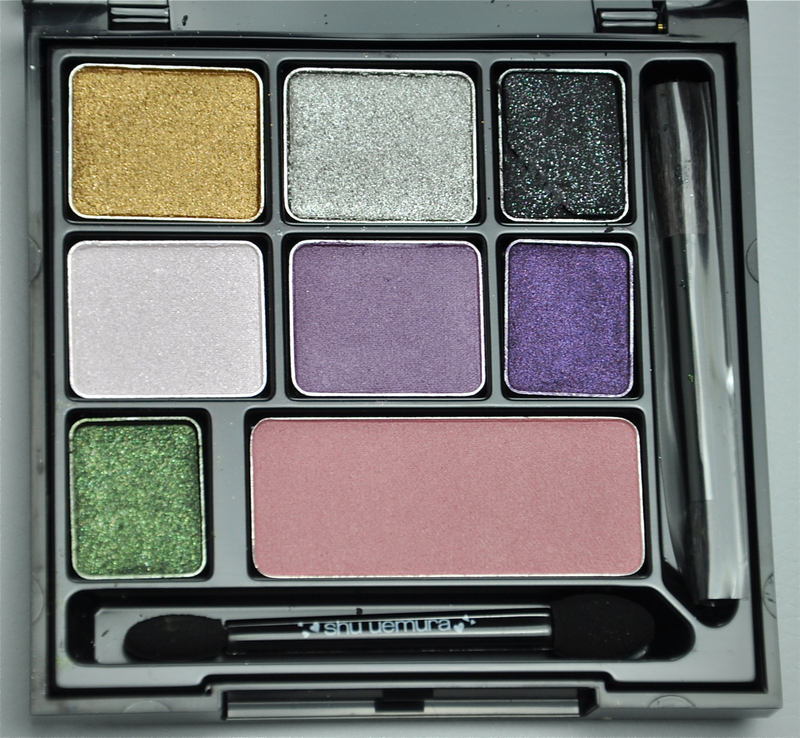 this palette is perfect for creating colourful smoky eyes, which is the trend for this holiday season. 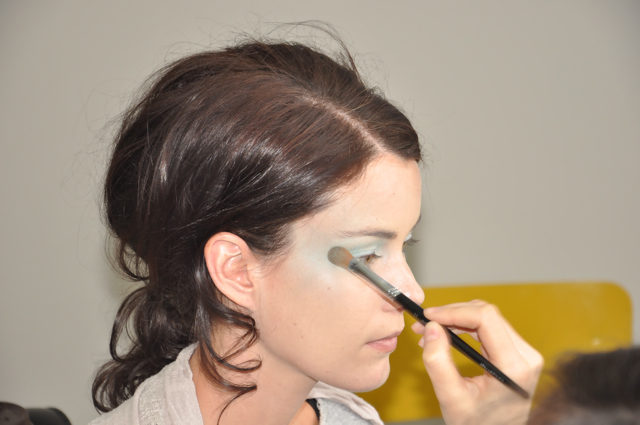 it’s easier to create a smoky eye using the new gel liner to start (lining the eyes), then using the black shadow along the lash line blending upwards. 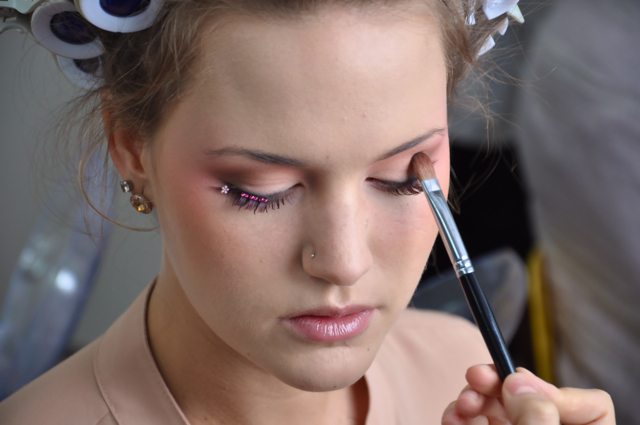 following the liner, use either the dark violet or gold shadows on the centre of the lid, blending into the black shadow. 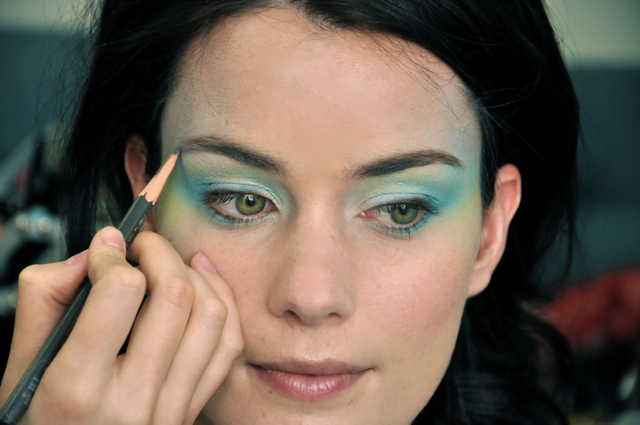 the green shade can be used to soften the black shadow edges to create gradation and the silver or the iridescent lavender can be used as accent highlights to the inner corners of the eyes are the bottom lash line. 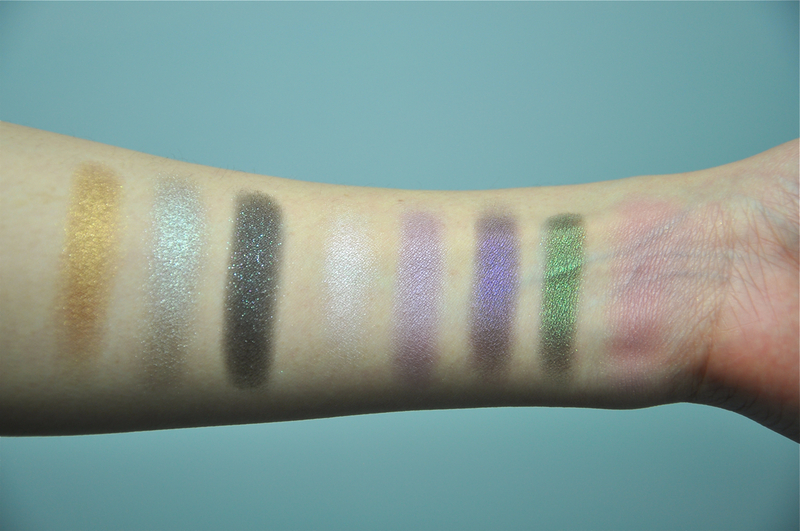 the texture of the eyeshadows are phenomenal. 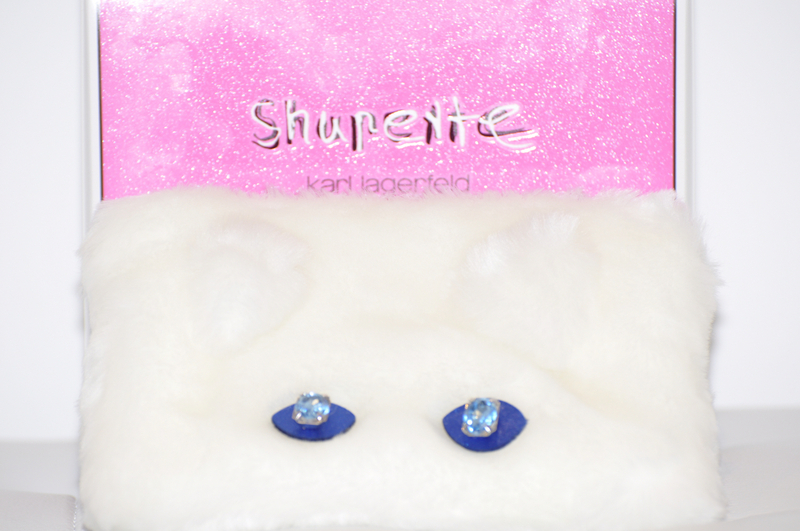 they are similar to the velvety shadows in the karl for shu palettes – extremely smooth and intense colour payoff. 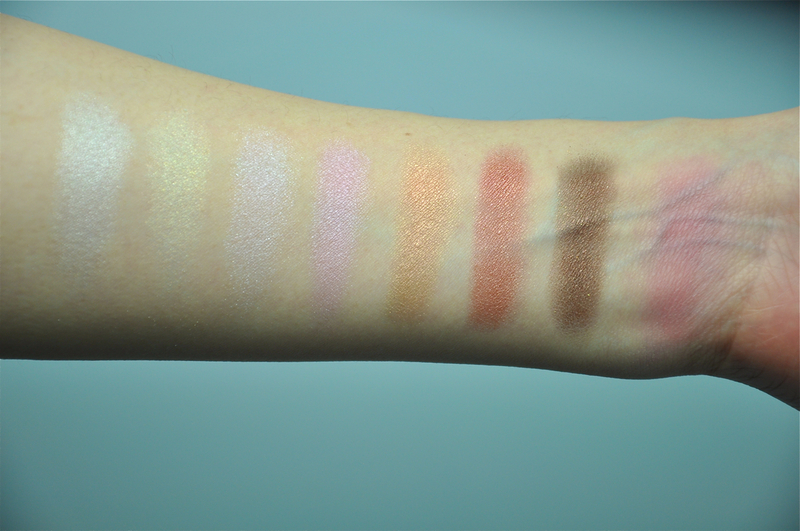 the difference that i noticed is that these shadows feel almost creamy to the touch; when applied, it feels like cream but has a powder finish. it’s like the cream and cheek stain of this collection. the shadow are, however, very delicate. so be careful when transporting the palette because i find that the shadows can break apart if not handled with care. the black shadow of my black princess palette cracked on route to me in the post.. so sad! 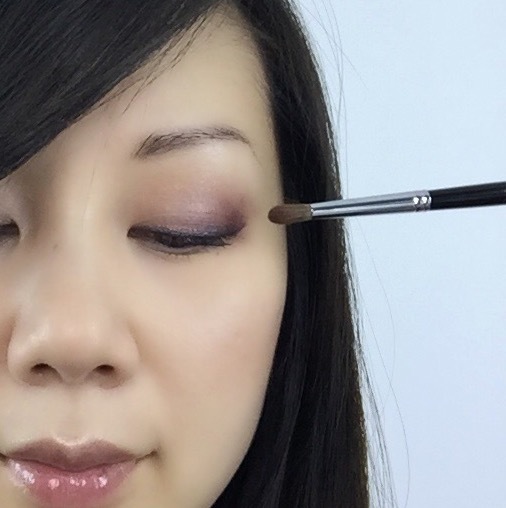 but there are, of course, ways to repair broken eye shadows using alcohol. 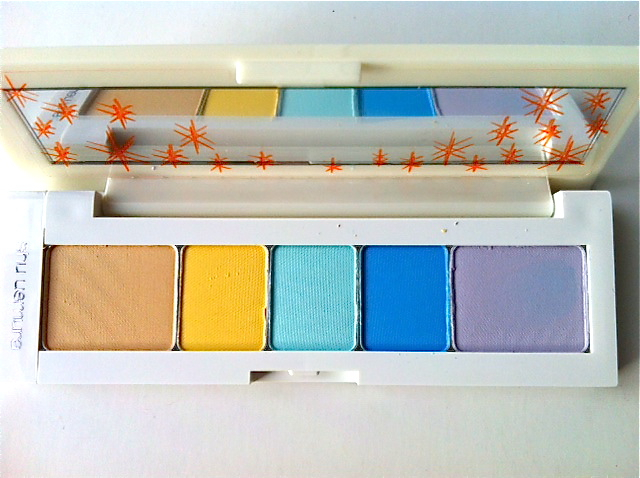 i’ll be fixing my palette! 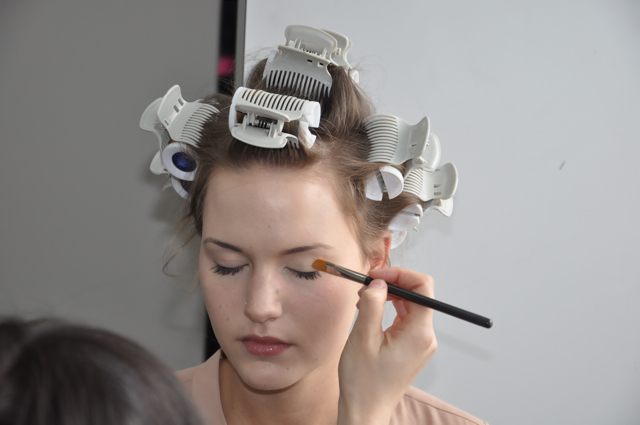 this is the new generation s curler by shu uemura. 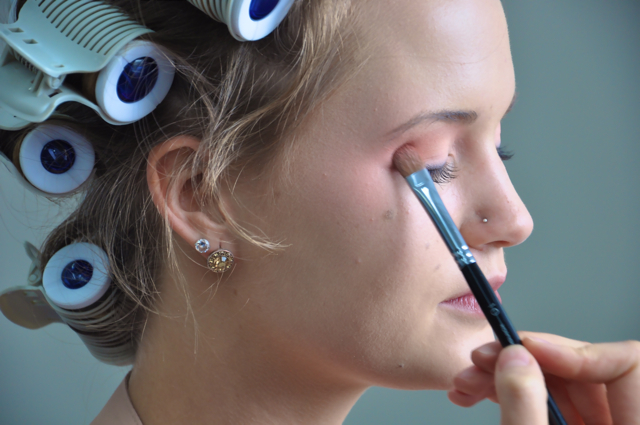 it’s designed so that you can curl sections of lashes at a time. this curler is ideal for smaller eyes which may be harder when using the original lash curler since not all of the lashes seem to get curled. personally, i’ve never had a problem with the original curler, but i love this new one when . 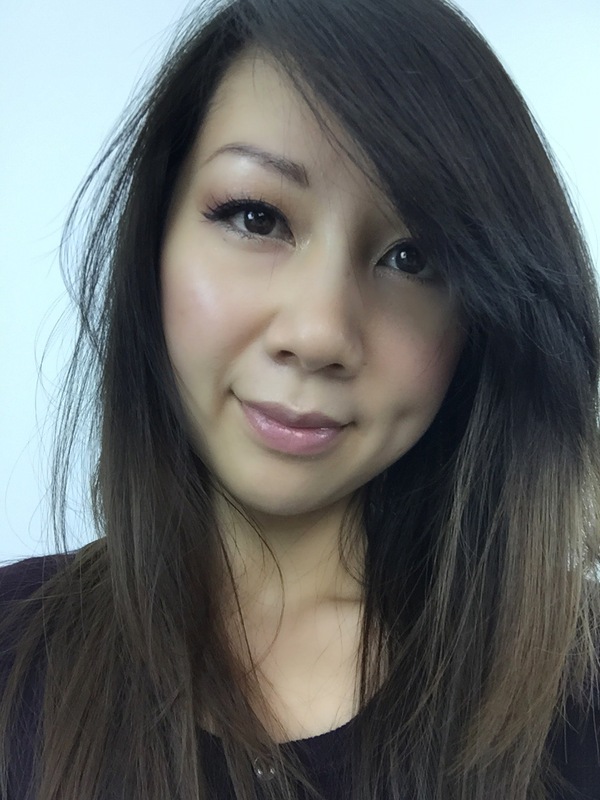 i like to clamp my real lashes to the falsies using this curler so that they merge together – avoiding the horrible 2 set of lashes look! this new curler is far improved from the the original mini curler by shu uemura because it doesn’t have the side bars which got in the way of curling before. i was so happy when shu came out with this curler! 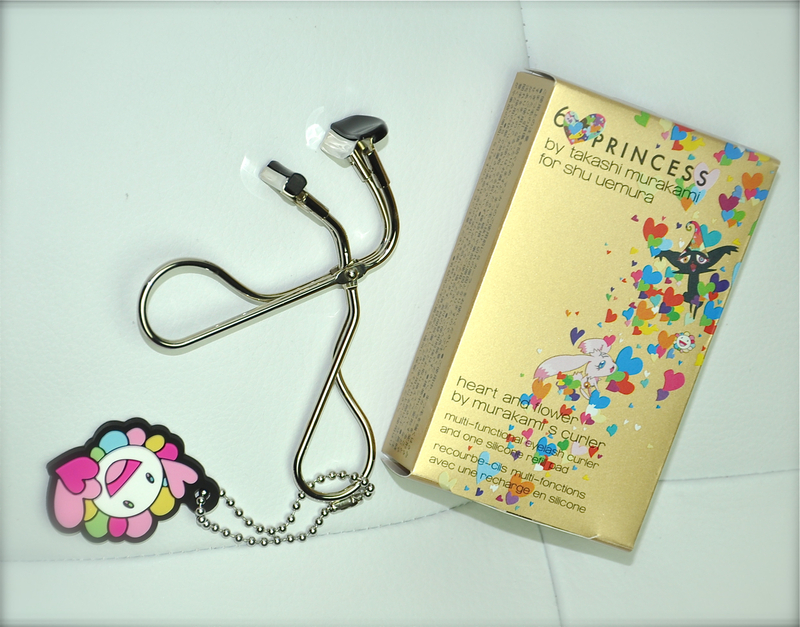 i was using another korean brand mini curler before this, but the padding is nothing compared to shu uemura’s! this is the ultimate liner for me. 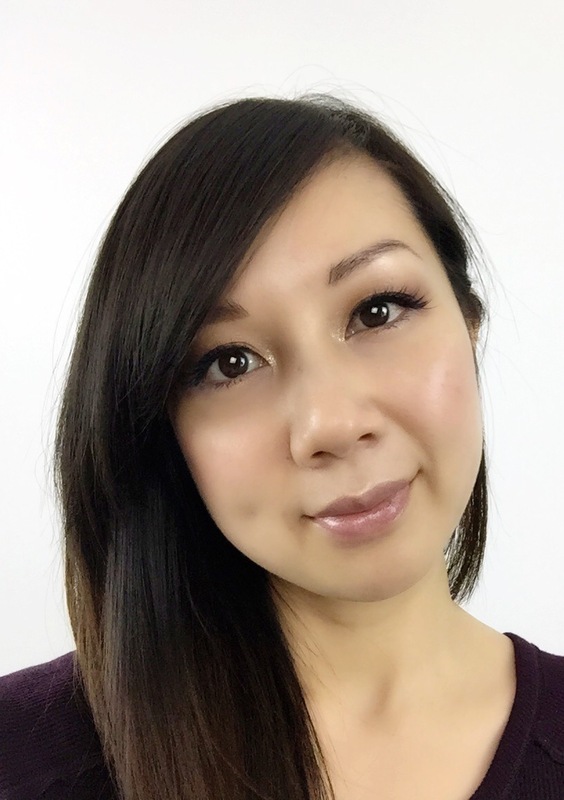 i had always been using the shu uemura painting liner (a gel liner that dries completely waterproof, even when i use it on my waterline; no smudging). the only thing that i found tedious was having to clean my brush every time i applied liner. 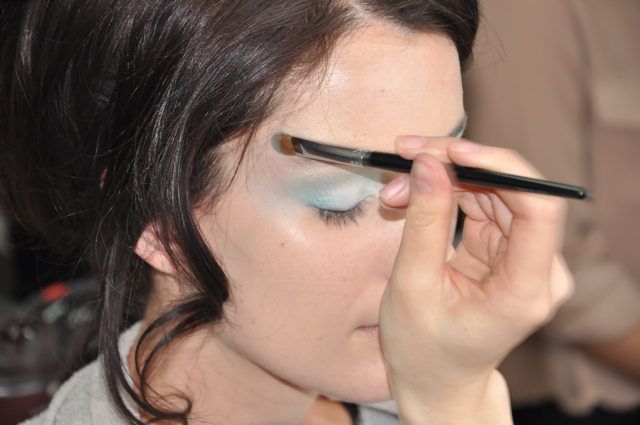 with the new gel liner, i can get that gel finish without the brush. 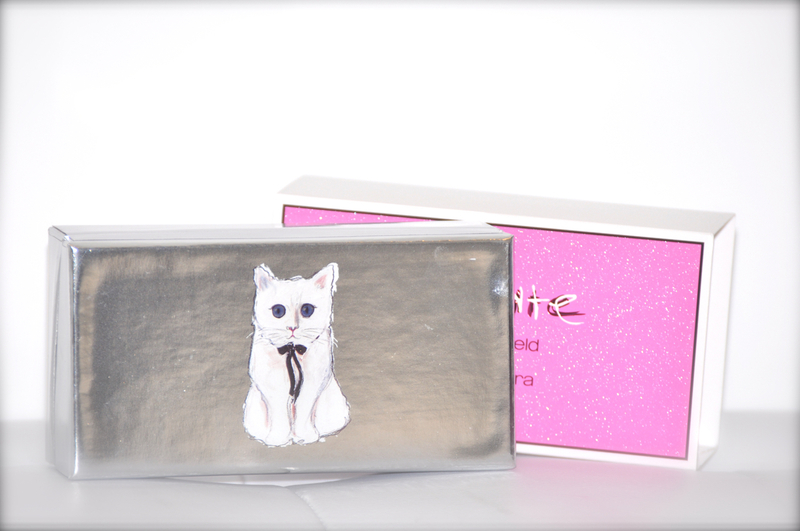 the finish is smooth and it’s soft so it’s easy to apply when tight lining eyes. so when i first got this, i was thinking that my lips would look like i just ate a popsicle or a lollipop because that’s what tends to happen whenever i try a lip stain. but the finish of this stain is different. 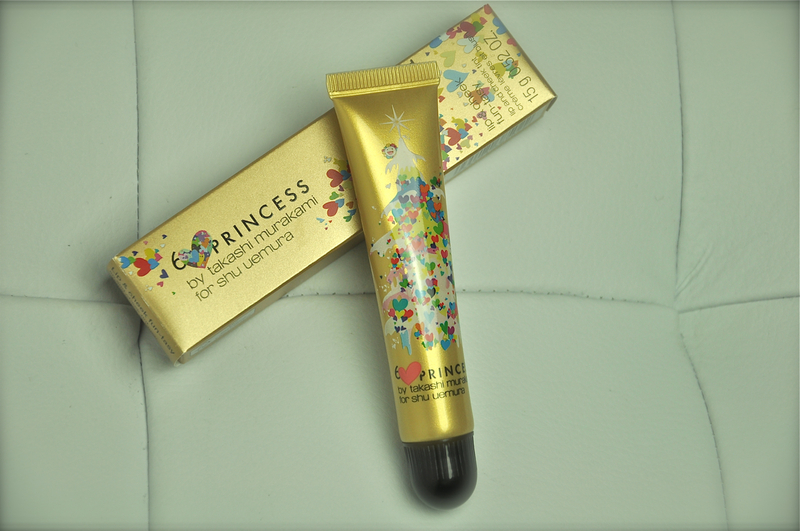 it comes out of the tube creamy but as you smooth it out, it becomes velvety and soft. 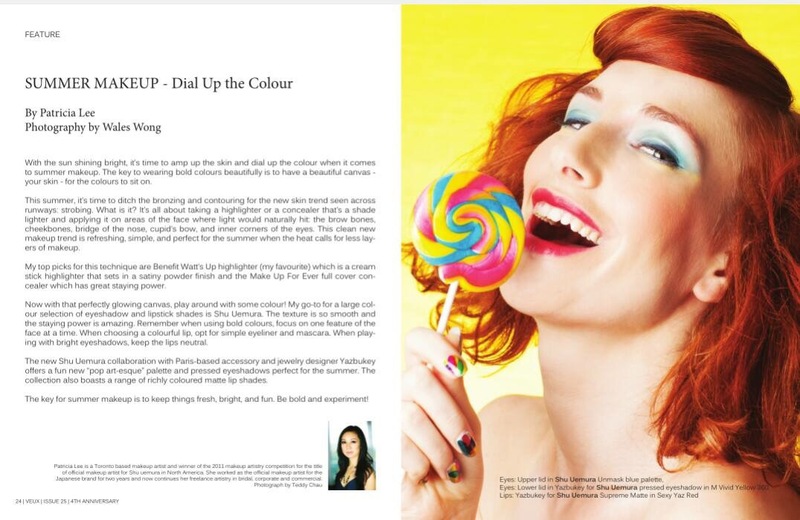 the colour is more like what i’d expect from a lipstick as opposed to a lollipop! personally i love this because it’s super easy to take out with me for my cheeks and lips. 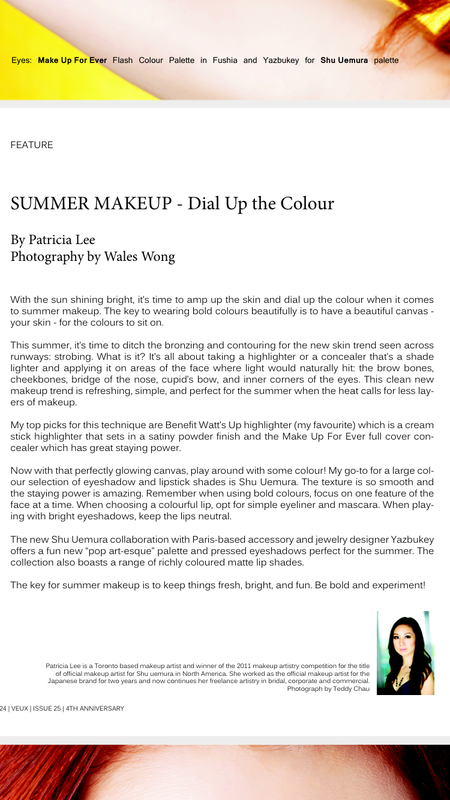 it’s great for those lazy or busy days (which i’ve had many lately) where i can just add some colour to my face so that i look less tired without having to do the whole works with my eyes. 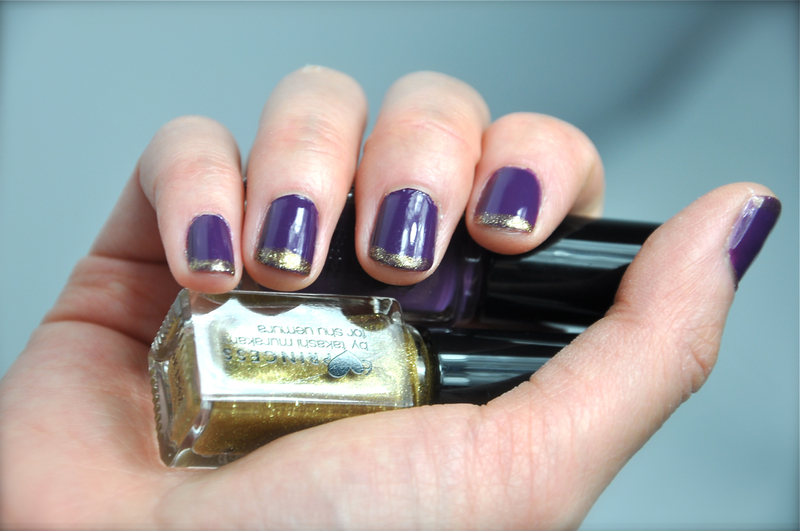 the collection features 2 nail duos: pink and glitter & purple and gold. 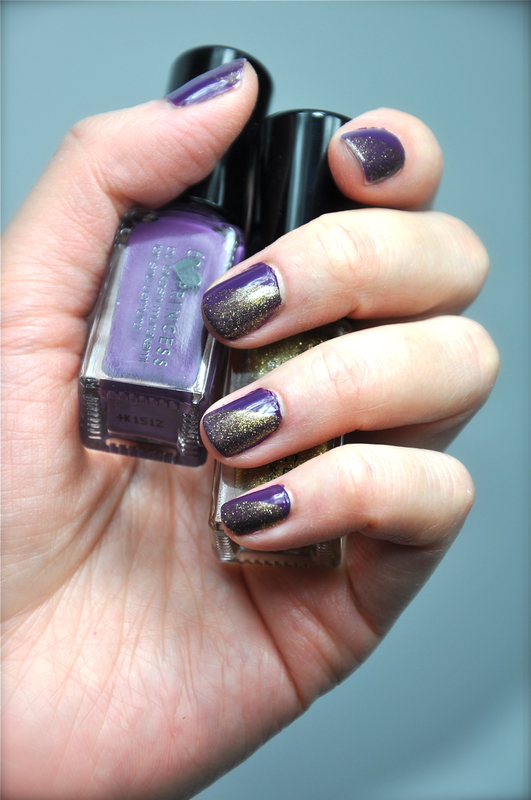 i have the purple and gold one which is a nice change from the typical red nails for the holidays! 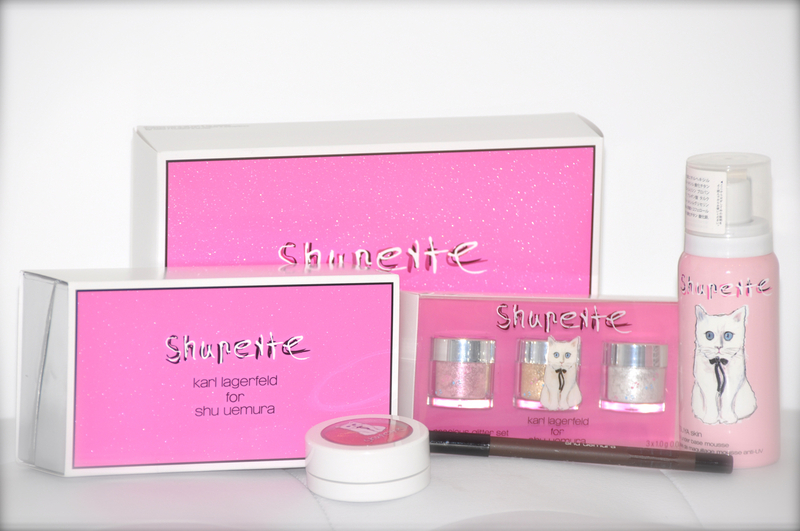 the shades can be used alone since the gold polish has a thicker consistency compared to previous glitter polishes by shu. i used 2 coats for the purple polish; it goes on smooth without streaks. for the gold polish, i just used one shade as embellishment. i’ll be doing some makeup looks soon! 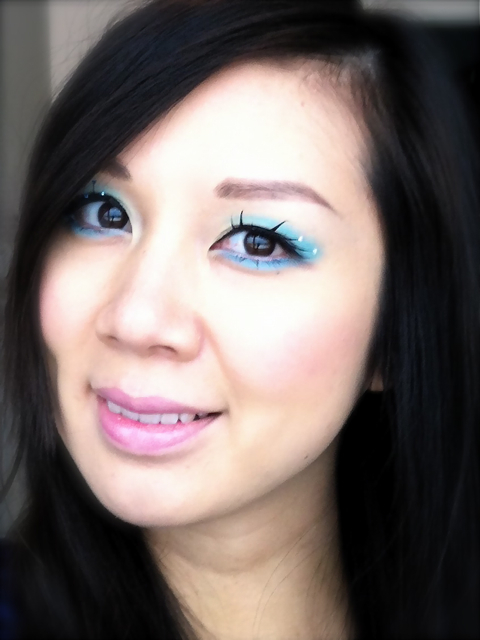 christian louboutin for shu uemura lashes! international artistic director for shu uemura, kakuyasu uchiide, designed a lovely pair of limited edition lashes for the christian louboutin exhibition at the toronto design exchange exclusively available in canada! i used the rouge et noir lashes to create a femme fatale look captured by photographer mark darren mui and edited by the retoucher extraordinaire james mui. 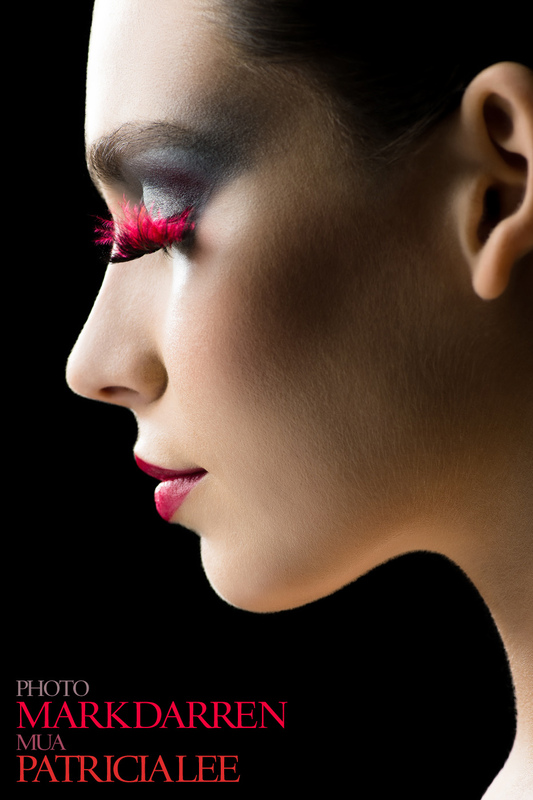 we wanted to create a sultry, moody photo composition to complement the seductive and enchanting lashes. 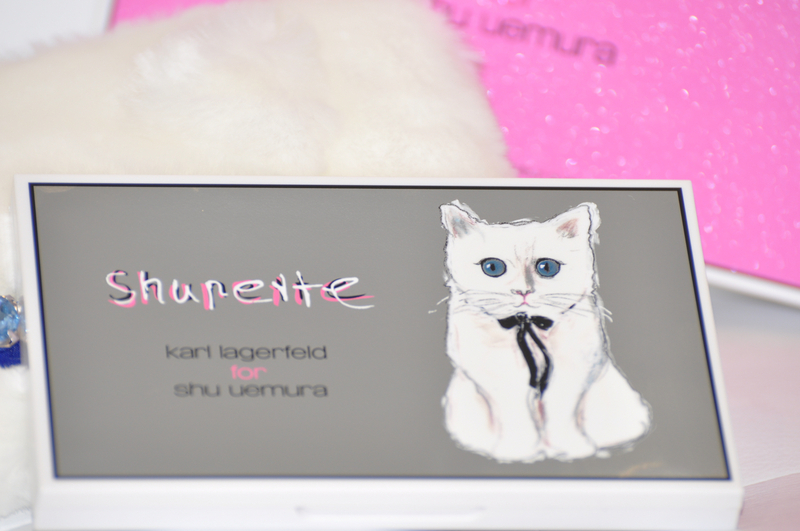 visit www.shuuemura.ca to find out more about the lashes! 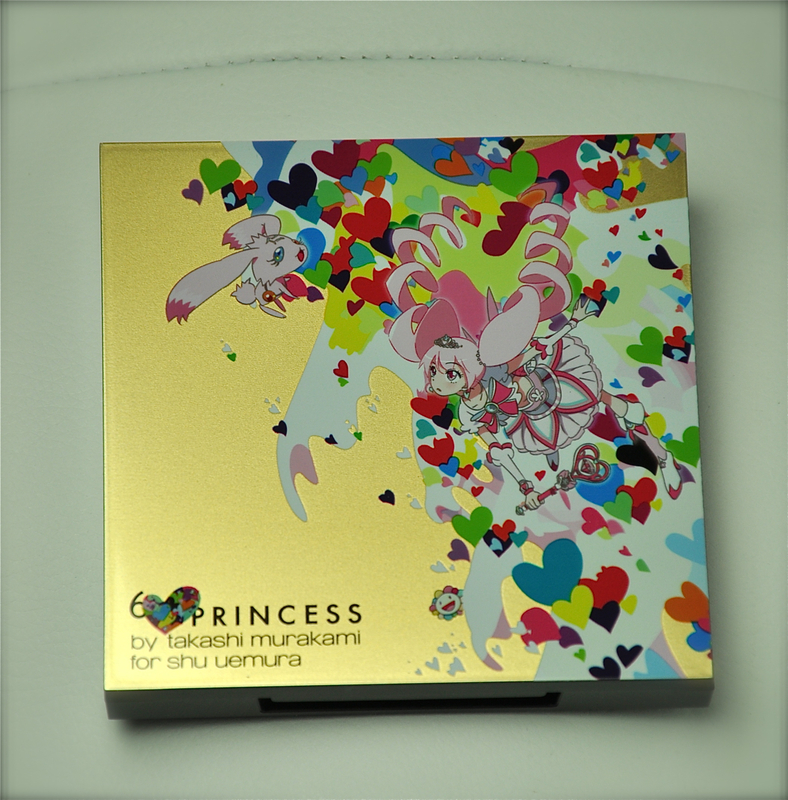 the shu uemura spring collection designed in collaboration with japanese artist ob, features four princesses each with their own persona. 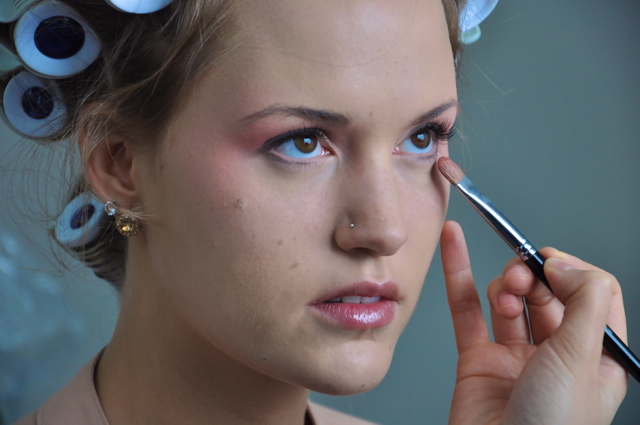 the second makeup look that i did was based on the cherry blossom princess. soft princess curls hairstyle designed by Lip Lap of Initium Hair in Markham, Ontario. hope you enjoyed the post! 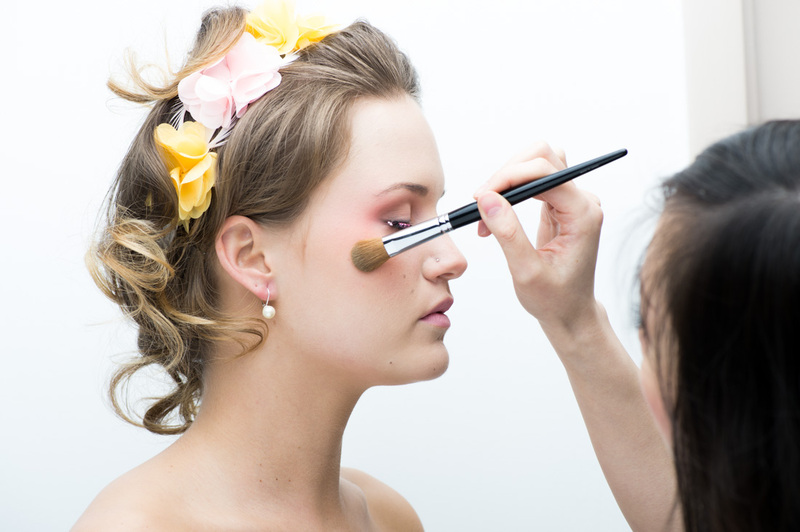 share with all of the makeup artists out there! have fun experimenting! she created a universe where four princesses can be found: cherry blossom princess, moon princess, forest princess and ocean princess. for the collection, i had the opportunity to create four makeup looks using the new spring eyeshadows and lipsticks to reflect the four princesses. 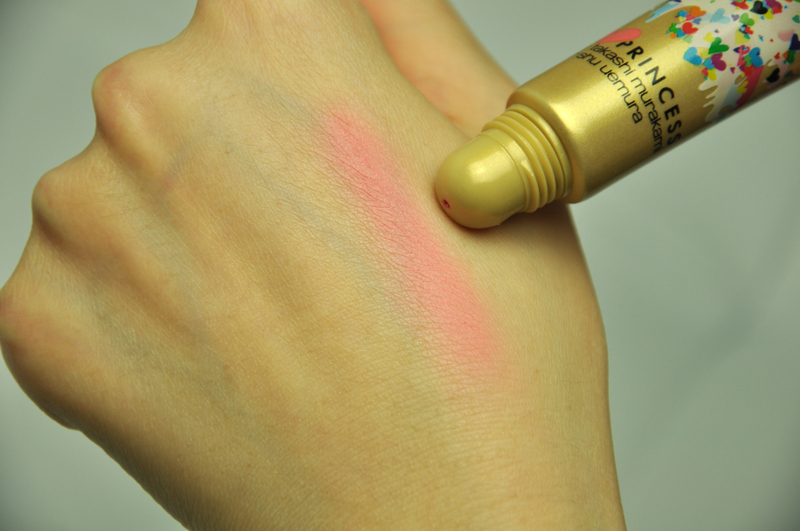 cover crayon to conceal darkness under eyes and redness around nose and lips. 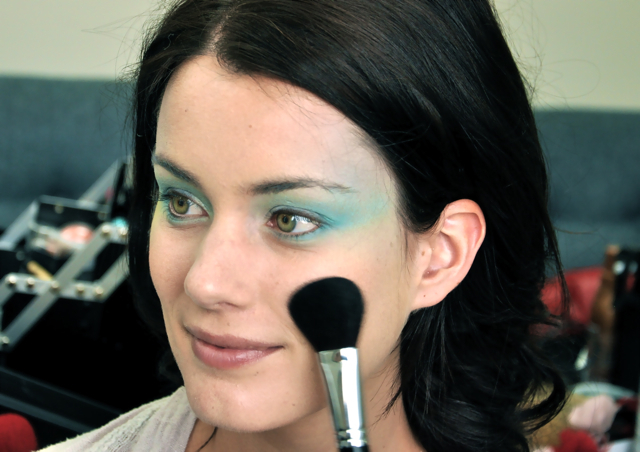 blend with synthetic brush 10.
cover crayon on lids to even out skin tone for pastel colours. 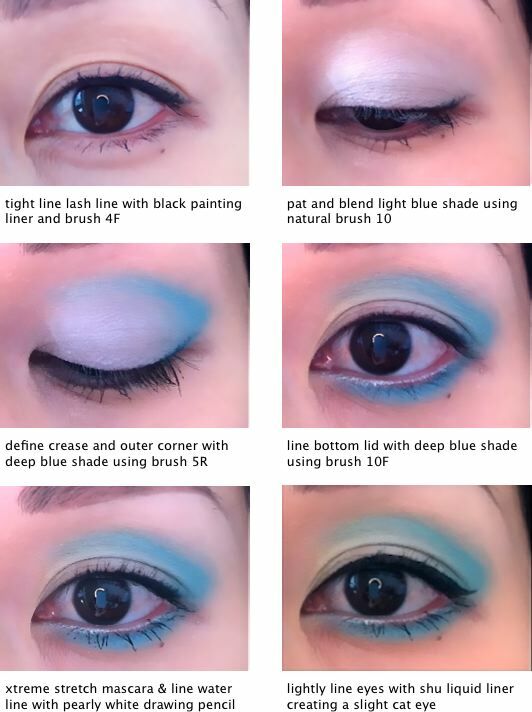 blend using synthetic brush 10.
brush 10 and brush 11 to apply lavender shade above temples blending into the blue shade. 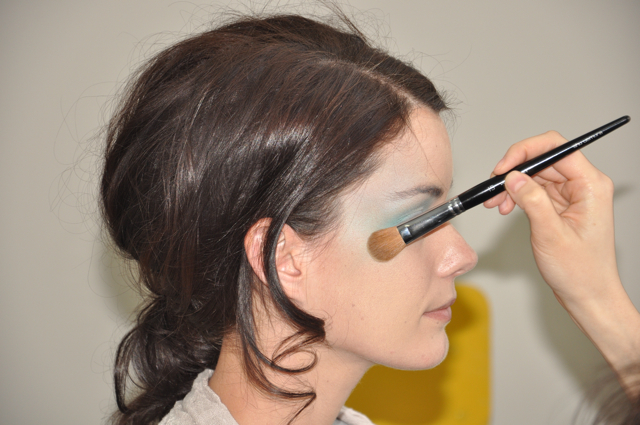 brush 15 to apply yellow shade on cheekbone blending into blue shade on temples. 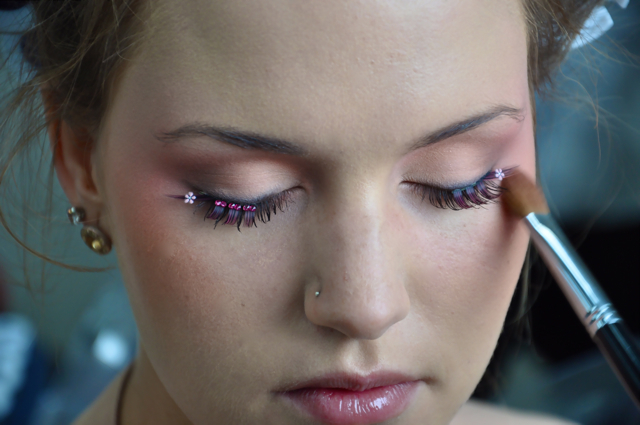 for the makeup artists out there, have fun experimenting with this look! review for the ob collection to come soon! getting ready for spring? 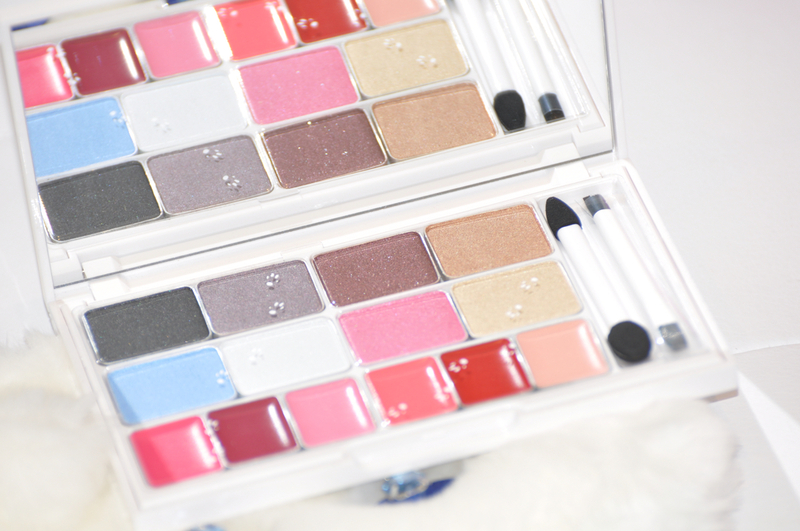 it’s time to pull out some colourful eyeshadows and to shop for some new makeup goodies to add to your collection! 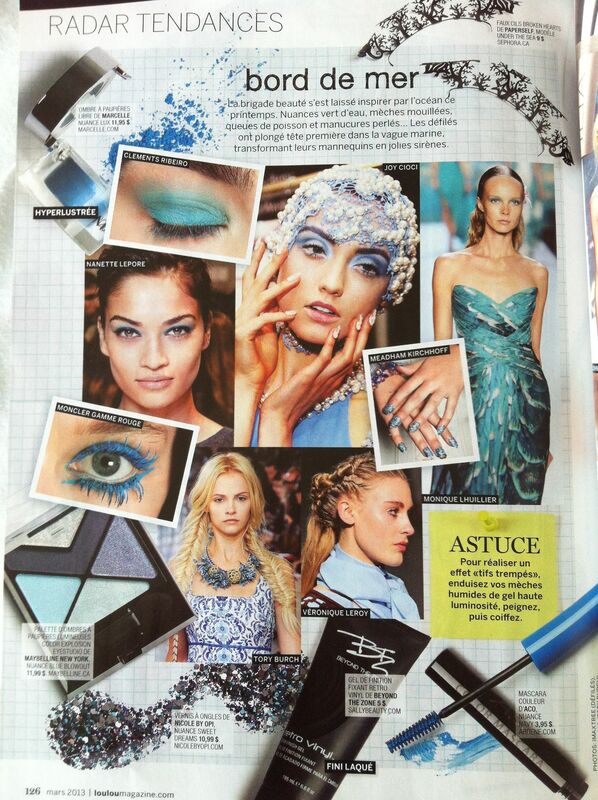 flipping through magazines and browsing online, i was inspired to create a aqua marine makeup look to reflect the spunky colourful liners seen on the runways this spring season. 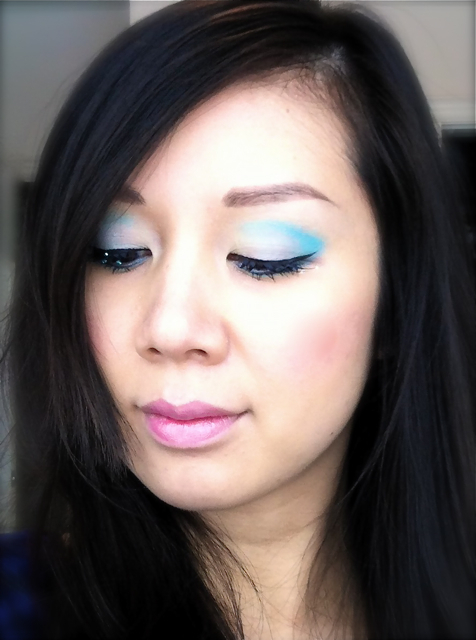 EYES: i used the dream blossom blue palette for this look. 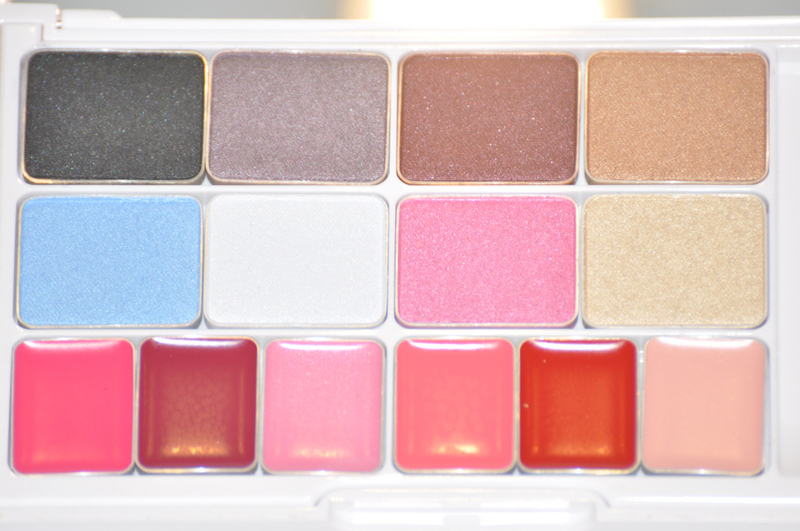 click here to read my review on the palette. 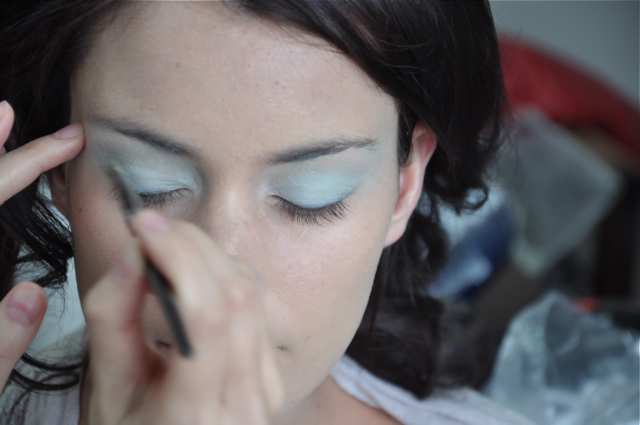 click here to view the brushes that were used for this look. 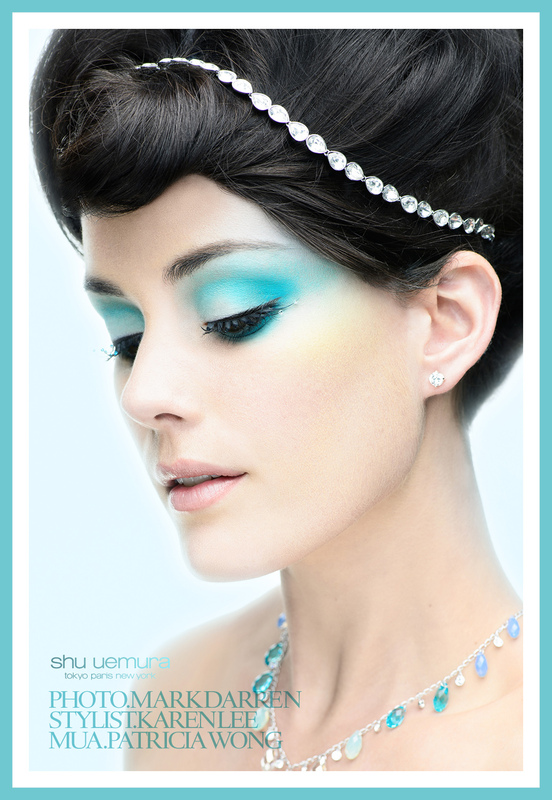 the ocean beads lashes used for this look are part of a collaboration with japanese contemporary artist OB and shu uemura. OB created a magical world where we can find four princesses living in a fantastical universe each having their own distinct features. 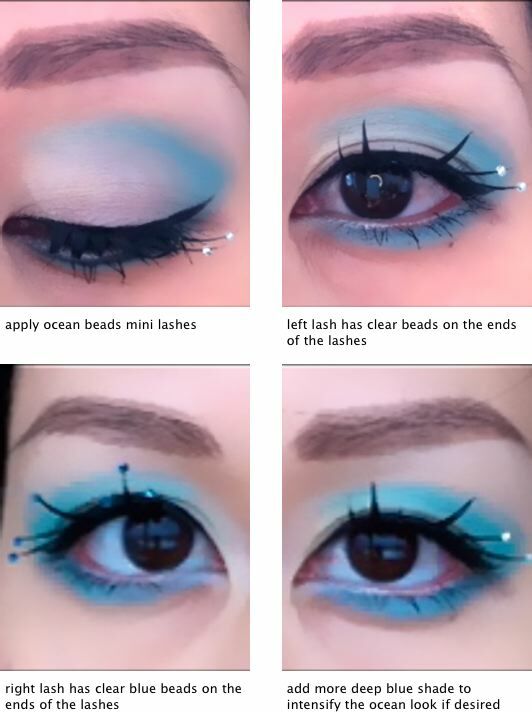 these lashes were created with the ocean princess in mind. 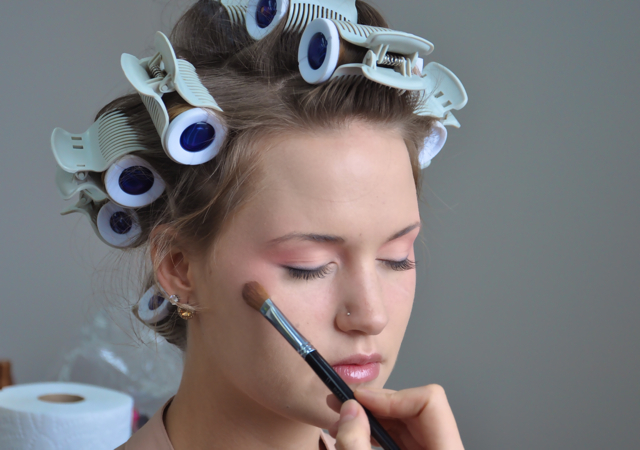 apply new P soft pink 324 glow on on apples of cheeks using brush 20 using the flat side of the brush for most smooth and colour intense application. 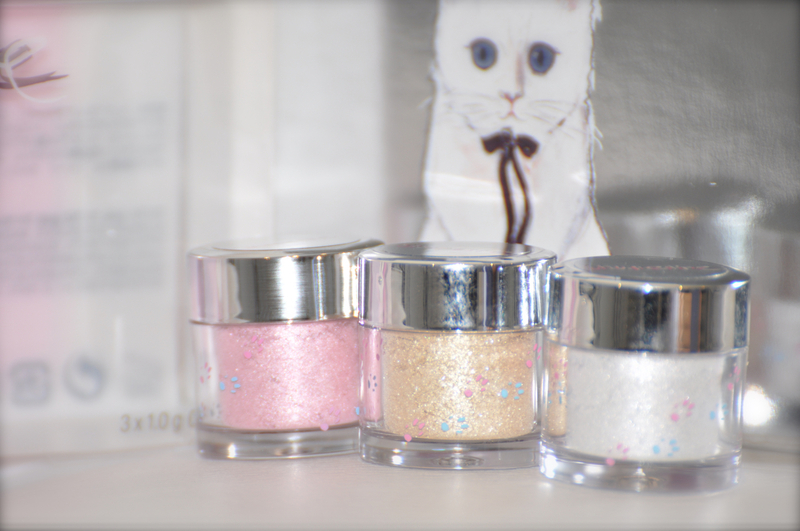 click here to read my review on the new glow ons and on tips on how to use them. make sure lips are well moisturized. i like to use the depsea hydrability lip balm. 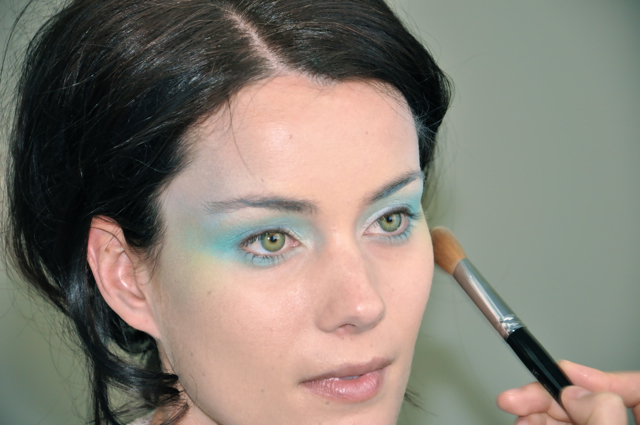 have fun experimenting with this trendy aqua marine look!